This review/interview was initially posted on the Montreal Review of Books. The World is Moving Around Me is made up of a series of first-person vignettes. 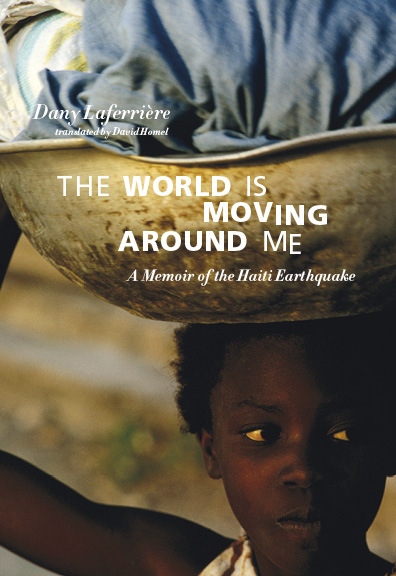 Laferrière zeroes in on poignant details of the aftermath, bringing this cataclysmic event down to a human scale. At the Hôtel Karibe, he and the other hotel guests slept outside on the tennis court after the initial quake, enduring another 43 tremors through the night. With limited means of communication, the author only realized the unfathomable depth of the disaster when he heard song in the early hours. A large crowd of people had formed in the street to sing, using song to assuage their pain. Nearby the hotel, a woman spent the night speaking to her husband and three children trapped beneath crumbled concrete, each of them eventually falling silent except for her squalling baby. In the end, only the smiling infant was pulled from the rubble. In the hours that followed, news trickled in of the destruction of the Presidential Palace, the courthouse, and the taxation and pension office. After overcoming the initial shock, survivors had to contend with not only their guilt but also their fear of not finding their loved ones. Fortunately, Laferrière’s friend arrived at the hotel, offering to drive him to see his mother and sister, whom he had been unable to reach. On their way, the first thing they saw on the side of the road was a woman sitting with her back to a wall selling a dozen mangoes spread out in front of her. The mango vendor is a prime example of what the author refers to as the Haitian resilience—a woman who returns to selling mangoes, her livelihood, the day after a massive earthquake. “The mango vendor became the symbol of renewal after the earthquake.” Laferrière told me over coffee. “That was the point when people started to pick themselves up.” The human side of the reconstruction had begun. I also asked Laferrière how it fit into his body of work. He said, “I wrote it precisely because it was in line with my work. For me, it was fundamental, a way of making sense of the earthquake.” And that is exactly what the World Moving Around Me allows the reader to do—make sense of the earthquake. It also serves up a compelling argument for why we need more long-form journalism. : The World is Moving Around Me: A Memoir of the Haiti Earthquake By Dany LaferrièreTweet this!